As promised, this is the outfit I wore for my family's Christmas celebration! 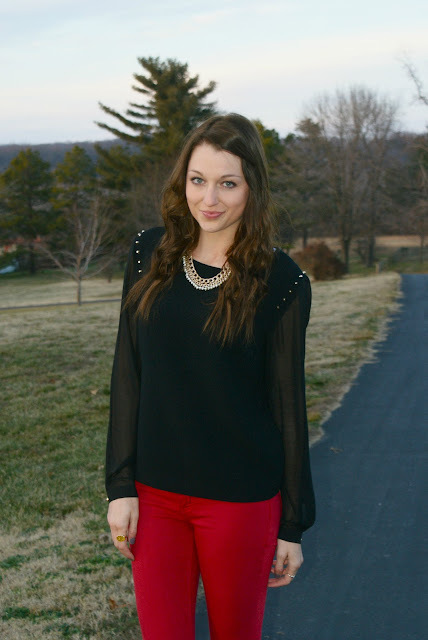 I very rarely wear these red jeans, but Christmas seemed like a fairly fitting occasion ;) I purchased & received lots of adorable new clothes this past week (including this studded top) and I can't wait to style them! I hope all of you are enjoying the Christmas season with friends and family and are receiving lots of goodies at the same time! I soo love this outfit on you!! The red jeans are so cute with that top- I love F21!! The necklace and spikes are so edgy. Hope you had a wonderful xmas!! Those jeans look amazing, I love how you wore it with all black! That top is so cool, I love the shoulder details :) and dang those shoes! I will never get tired of seeing them because they are so pretty. 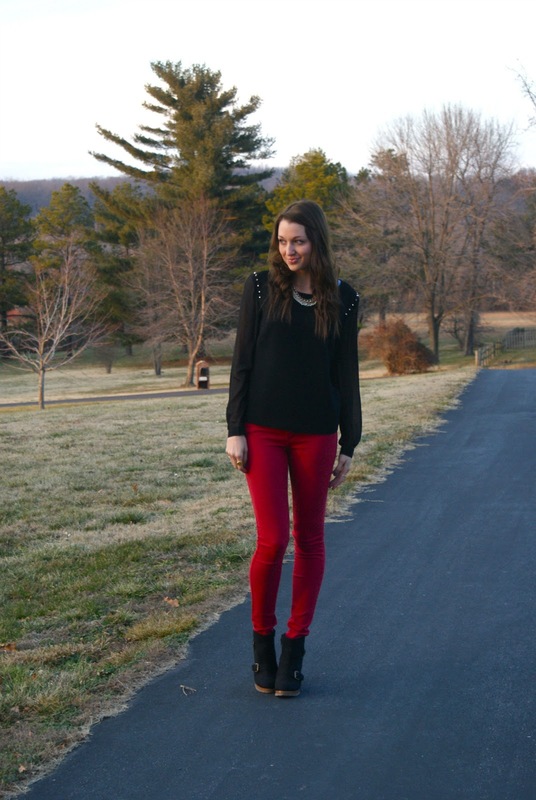 I love the studded top and those red jeans look great on you. You should wear them more :-) Hope you enjoyed the holiday. Another favorite of mine here! You look so beautiful, Jacy.. Merry X'mas! Cute outfit! Love those boots! I love Pac Sun jeans- sometimes they are the only ones that fit me! I need to pick up some more now that you've brought it to my attention! Really pretty sweater and red jeans! Hope you had a wonderful Christmas girl:)! Hi Jacy..Hi sweety, hope you had the most wonderful and memorable Christmas! 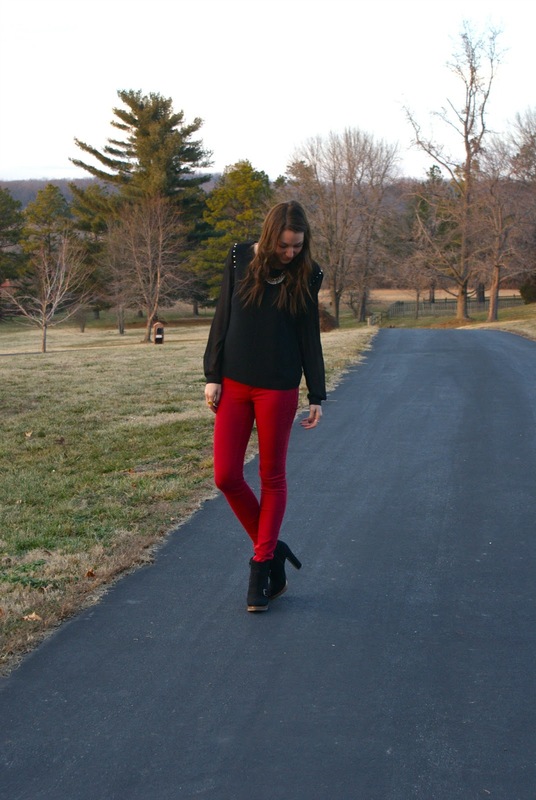 This outfit is so befitting of the season, thats the perfect way to wear red denim! Loving the red pants! Merry Christmas - follow each other? Love your shoes! Hope you had a fabulous Christmas! Gorgeous look. That dress is so pretty on you!! 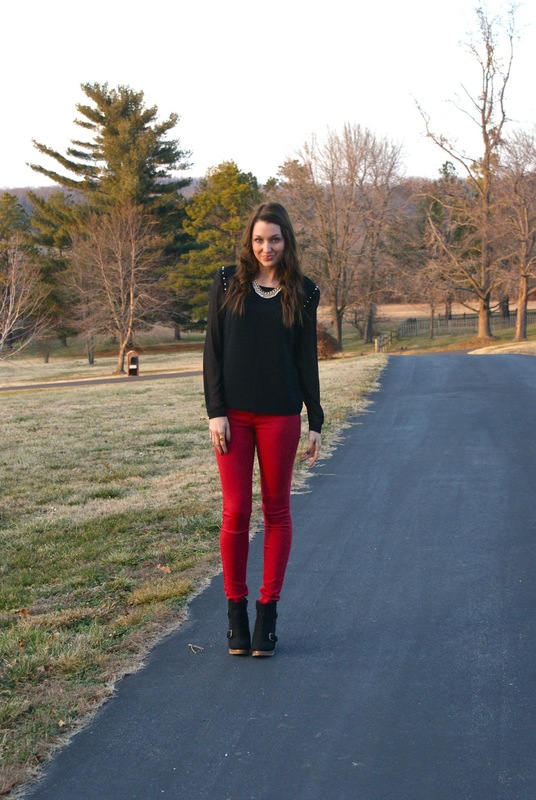 love that festive pop of red in your outfit! lovely! Can I borrow your long legs sometime? K, thanks. ;) Looking absolutely stunning as always! Gorgeous!! Lovely top :)Happy new year!!! I really like your blouse!! Thank you for visiting my blog ! Following you now . you look beautiful! love the combination and the color of your pants! u look so pretty hun!! love ur jeans n boots! ı loved the details on your blouse! I loved this rock chic look so much! So cute, I love those pants! Happy new year!! I like how you pulled red with black off ♥ So lovely!